On the 7th June 2017, we had the great privilege of gaining an inside glimpse into the world of Prince Albert II of Monaco. Saving the ocean is one of his top priorities. During the documentation of a special cocktail party hosted by Monaco at the United Nations, we soon discovered the reason why this global leader is so fearless in the way he is trying to save the ocean. This article was written on the very night of this big event. Prince Albert II with Hollywood actor Adrian Grenier at the United Nations, June 2017. Occasionally, you can see a boat zipping past below on the river with a guard holding a machine gun, while the guests above smile cheerfully and gather around Prince Albert II of Monaco shaking his hand, snapping happy photos on their iPhones, crowding around him, offering their congratulations on the big night. Before we continue, it is a fair question to ask - what does a fancy cocktail party have to do with saving the world’s oceans? To understand why perhaps the principality of Monaco’s cocktail party celebration, starting at 6:30pm 7th June 2017, had any significance at all to the future of the planet, we must speak with Alex Pani. Alex is Monaco Television’s royal correspondent to the house of Grimaldi of Monaco. She has a job that many would envy around the world. She is one of six reporters following the adventures of Prince Albert II and the royal household. While some people might envy her for close proximity to glamour, power and class, there is a much more subtle reason Alex enjoys her job. The glitter and jazz of the elite gathering in New York is interesting, but not as exciting as the reason behind why it is all happening. Alex has been following Prince Albert II for three years, and is rather focused on her job, which is full of structure, deadlines, and running after ‘His Serene Highness’ from meeting to meeting, day-in and day-out, on the days she has been assigned to him. 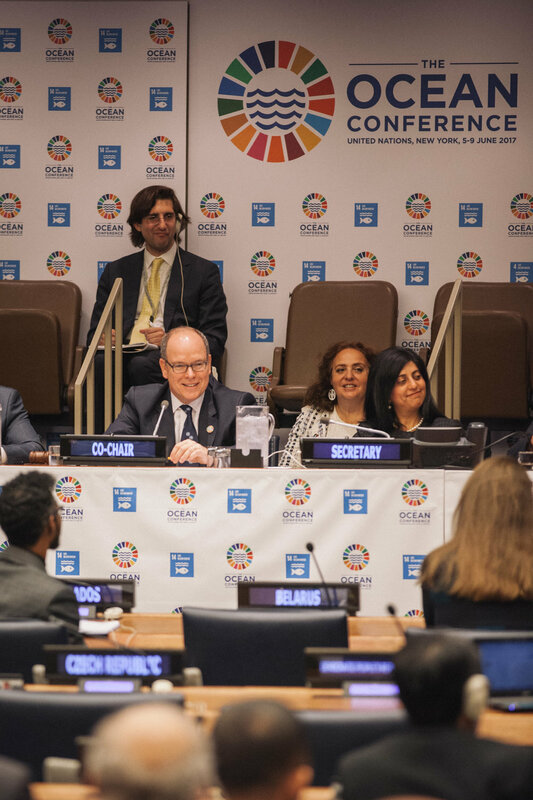 Prince Albert II co-chairs a session on climate change at the first Oceans Conference at the United Nations, 2017. However, Alex finds meaning not in the seniority of peoples’ ‘titles’ she meets, but in the reasons behind the sorts of international gatherings the Prince most especially likes to attend - like the one that is occurring tonight. She says that the Prince is really passionate about environmental issues, especially about the ocean, because Monaco is a country that is bordered by the sea. The Prince has grown up by the sea. “He thinks it is important to be here at the Ocean Conference (2017), the first one ever held by the United Nations. It is really important for him,” says Alex. Alex emphasises ‘really’ important. You see, Prince Albert perhaps is no ordinary public figure. He may look the part of a royal in his finely dressed suit. He may be one of the richest royals on Earth. He may live behind the walls of a magnificent palace, and in a country surrounded by the constructions of luxurious marinas, super yachts, fine villas, and some of the wealthiest people, and many people might dream to have what Prince Albert II has. However, to the contrary, the Prince, himself, sees that none of this matters, if we do not look after the most precious thing of all - our planet. The world is only a blink away from the advance of ocean acidification and a time where more plastic than fish fill our oceans, which is why perhaps the Prince has thrown the billionaire rule book out the window. UN Secretary General António Guterres meeting Prince Albert II for the first time, June 2017. He isn’t afraid to say that nations must ‘fight’ for the ‘environment’, our planet’s survival (at a time when ‘fighting for the environment’ can be a dangerous thing for an ordinary person to say) - and when he says this, he says it in such a well-mannered, softly-spoken New Yorker-sounding accent with a gentle smile that he makes it socially acceptable for the world’s billionaires to join him on a campaign to reverse the world’s perils. This man - who has studied political science, economics, psychology, English literature, the history of art, anthropology, geology, philosophy, sociology, German and music - is the only head of state to have visited the Arctic and Antartica with the goal to understand the impacts of climate change and to help raise awareness on the global stage. He is not burdened by the short-term cycle of politics where a leader has to fight for his or her own survival; to be re-elected. He is in a rather unique position to fight for a noble cause; and it will be a long-term battle, a life-long commitment on his part. Perhaps, this is the reason tonight's cocktail party is so important. Although Prince Albert II can move more freely than most in the realm of politics, Alex says there is still a lot of pressure on Monaco to 'show-off' the launch of one of Monaco’s voluntary commitments to help save the ocean. And, what better way to do that than with a cocktail party? (We can see that entertainment is a rather useful diplomatic tool). “During the Ocean Conference, there is a huge delegation of Monaco, because today is the official launching of the ‘Monaco Explorations’,” says Alex. So, the more we learn, the more we realise that the Prince is no ordinary prince, and that the Yersin is no ordinary super yacht, it is a ship that has been re-fitted with the vision of a philosopher, whose mind is clearly deeply rooted in a historical understanding of eras, like elements of the enlightenment period, where scientific investigation brought us closer to nature. The Prince is launching a grand plan - a renaissance in natural scientific exploration, re-fitting the ship with the world’s best scientific labourites, so its research teams can collect data from the deepest parts of the ocean, helping us to see things we have never seen before. But for Prince Albert II, it is more than a journey of discovery. He hopes it will reignite our society’s love affair with the ocean and science - and it all begins here, in this room. For the Prince, this is a life-long mission. He says that today has been a very emotional experience for him personally as he moves to relaunch a tradition of scientific exploration that his his great, great, Grandfather, Prince Albert I, started long ago. “I don’t know if we will save the world in three years time, but at least we will have contributed to a better understanding of different systems in our oceans,” says the Prince. Green Sea turtle, Great Barrier Reef, June 2017. His people depend on it, and so do we all - from the poorest to the most wealthy nations. We are all connected by this giant blue organ we call the sea, but not everyone understand this (or, not yet). So, the Prince has a lot of work to do - and he gets that. He gets that he needs to campaign for more wealthy friends to come join him: the good news is that when the Yersin launches, Monaco’s harbour will be full of Europe’s wealthy elite, who will know all about the Prince’s mission. And, hopefully, they talk. Hopefully, they throw their own fancy cocktail parties and announce the launch of their own scientific missions on their own big fancy yachts. Can you imagine? Maybe, just maybe, the Prince’s work might inspire the world’s elite to have a love affair with saving the ocean - now, that would be a romantic bestseller that could become popular with the younger generations to come. Great Barrier Reef, July 2017.